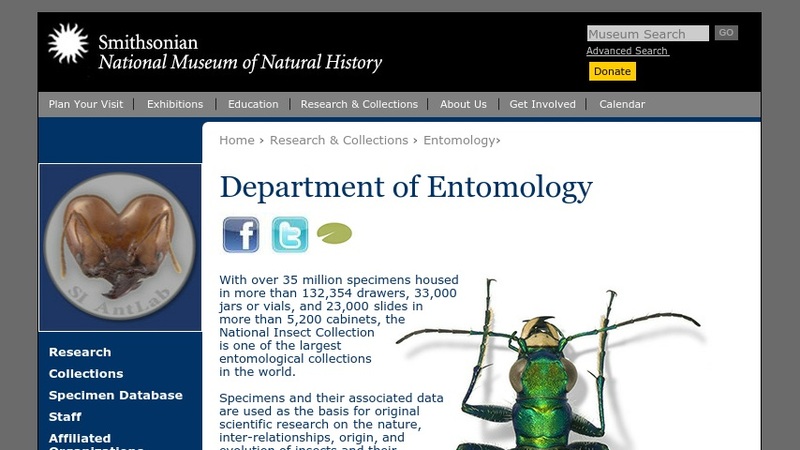 The Smithsonian Institution's Department of Entomology web site was designed primarily for researchers in the field of entomology (the study of insects). The research page features an overview of the department's research efforts and personnel. The collections page has an overview of the department's collections (typically arranged by taxon) with links to collection profiles. Collection profiles are arranged alphabetically by family and include numbers of specimens, preservation method, location, and primary and alternate contacts. Other materials include a statement of the department's mission, current and back issues of its newsletter, and information for visitors.